Begonia and Impatiens. Coleus steals the show with its showy foliage. It combines very well with impatiens, another warm-season annual flower. 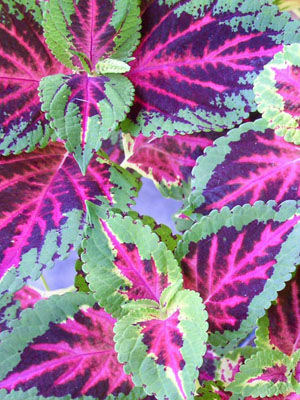 Coleus leaves are often splashed with shades of pink and red that can be used to echo the blossom colours of nearby flowers. Stem tip cuttings are easy to root in moist compost or plain water.